Before all my friends and family start hating me for my weird tirade on their children, I thought I’d take a step back and talk about this week’s culinary adventures. 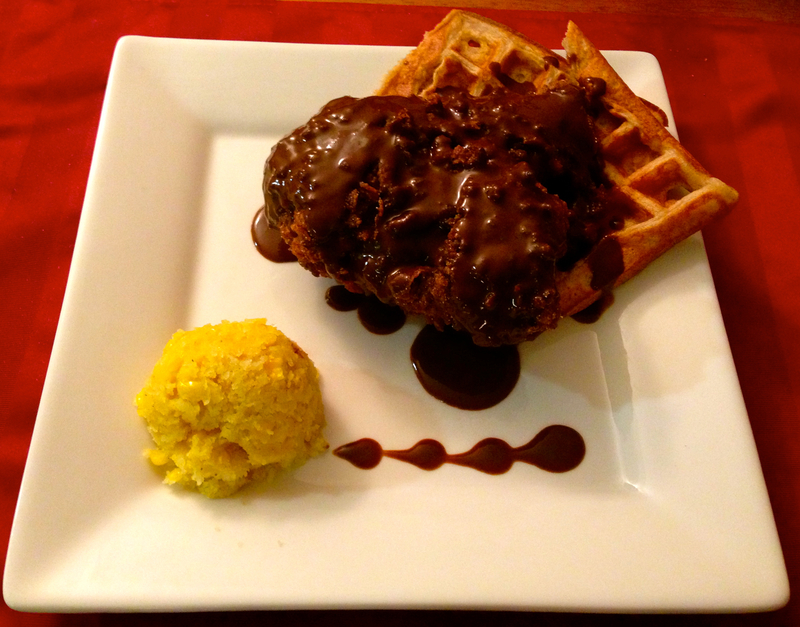 Last week, I tried my hand at a truly Mexican-American combination dish: Fried Chicken Mole and Waffles. This week, I went a little more traditional Americana. One of my coworkers is what I consider the definition of Southern sweetheart…with an edge. As I’ve made something of a habit of bringing baked treats in to work for notable (and some not-so-notable) occasions, when I found out her birthday was coming up, I couldn’t help myself. I decided to make a cupcake that reminds me of her–something Southern, sweet, but definitely edgy. 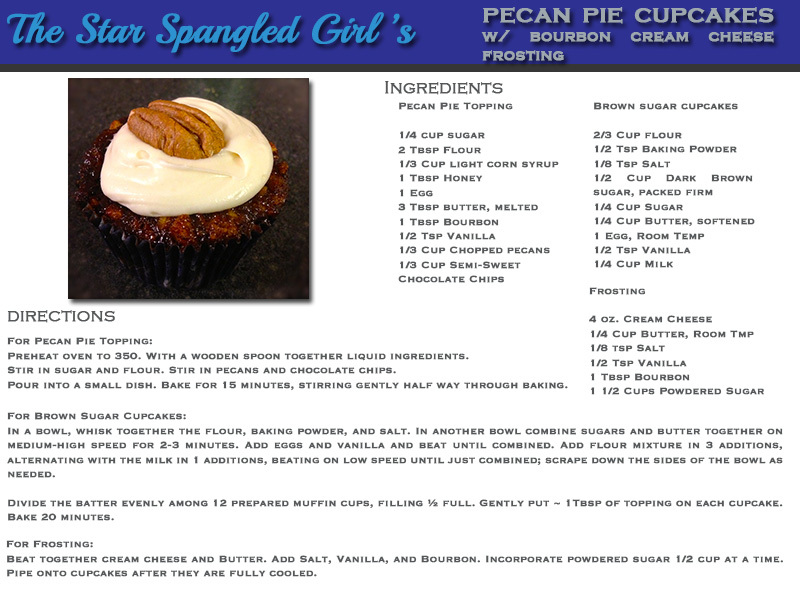 That’s how I came up with my recipe for Pecan Pie Cupcakes w/ Bourbon Cream Cheese Frosting. I’ll warn you, when I say Bourbon, I mean mean Bourbon with a capital B! The sweet, sticky pecan pie mixture caramelizes on the top, while simultaneously seeping into the airy, pillowy brown sugar cupcake. Then it hits you, the unmistakeable warming tingle of bourbon. Between the sugar and the booze, you may feel a little woozy for just a second. That’s to be expected. Then you open your eyes and you’re standing in your work kitchen, realizing that you actually grew up in Los Angeles, and were far more likely to be slipped a margarita than bourbon. But that’s the magic of it…. Today, Thought Catalog published a post in a similar vein to my most recent blog. I thought I’d share. Also, this gives you some insight into my reading material. A statistical analysis from England suggests that a woman’s IQ is inversely proportional to her desire to breed. This, in turn, suggests that the world will grow dumber with every new day. With each increase of 15 IQ points, a woman’s urge to reproduce is diminished by 25%. The average IQ of women who want children is 5.6 points lower than those who don’t want them. Among all 45-year-old women in England, 20% are childless, but this figure rises to 43% among those with college degrees. If any value is deeply evolutionarily familiar, it is reproductive success. If any value is truly unnatural, if there is one thing that humans (and all other species in nature) are decisively not designed for, it is voluntary childlessness. All living organisms in nature, including humans, are evolutionarily designed to reproduce. Reproductive success is the ultimate end of all biological existence. Kanazawa’s findings correlate with a 2010 Pew survey that found women ages 40-44 with a master’s degree or higher are 60% more likely to be childless than women who never graduated high school. But it is specifically his research on race and intelligence that causes his critics to dismissively snort that he is a zero-credibility genocidal wackjob who peddles junk science riddled with huge methodological flaws that raise the terrifying notion of eugenics that has long been debunked and discredited because of, well, Hitler and everything. Kanazawa’s persistent provocations raise the issue of whether he can do his job effectively in a multi-ethnic, diverse and international institution. His statistical findings do not jibe with our cultural dogma. The only responsibility scientists have is to the truth. Scientists are not responsible for the potential or actual consequences of the knowledge they create. The most egregious blasphemy one can utter in today’s insanely stifling and repressive climate of intolerant egalitotalitarianism is to gently suggest that genetics play any role in determining intelligence differences and relative prosperity between individuals and social groups. Yet (grab a hankie) that’s what the evidence suggests. 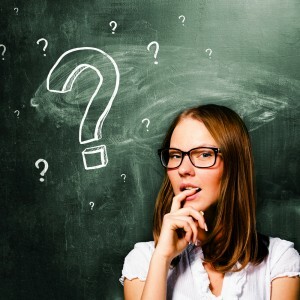 Despite the propaganda the media uses to try and blow out your eardrums, the scientific consensus suggests that adult IQ is roughly 75-85% inherited. But due to the currently taboo nature of this fact, Western researchers are unlikely to even suggest such things publicly without sacrificing their careers. The Chinese suffer no such ultimately dysgenic superstitions and are forging ahead in their attempts to crack the code. This might be one of the main reasons why the coming century could belong to them. Further buttressing Kanazawa’s findings, global evidence suggests that high IQ tends to be negatively correlated with total fertility rate. 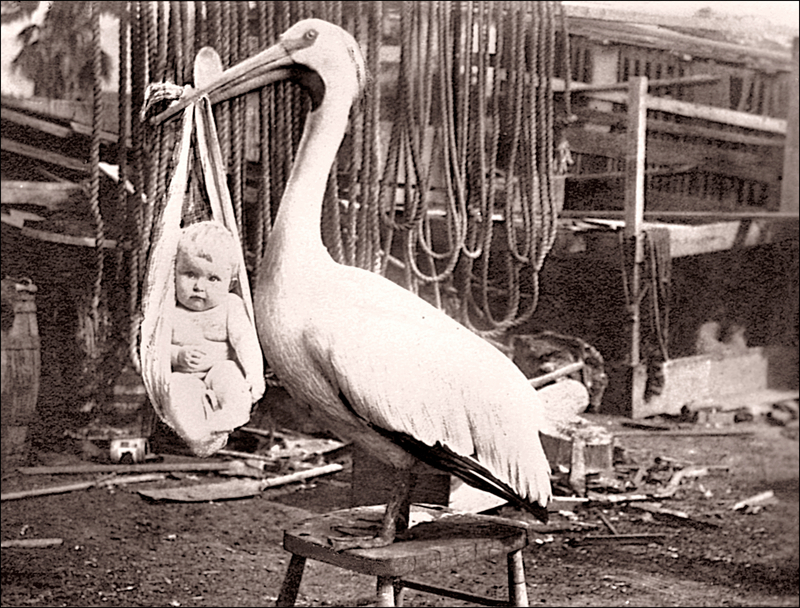 J. Philippe Rushton’s r/K selection theory noted that parents who actually invested time and thought in nurturing their children tended to have fewer of them…and vice-versa. Intelligent people have the reflective capacity to consider things such as whether they’d have the economic wherewithal to raise successful offspring, whereas dumber people tend to invest as much thought into reproduction as they do to defecation. The end result is an increasingly dysgenic world—Idiocracy made flesh. Western sophisticates claim that the world already has enough people, and many tend to see it as a matter of conscience to not breed. The problem is that hordes of Third Worlders suffer no such ethical qualms. Paradoxically, the pampered First World utopian ideal that the world should be intelligent, sustainable, and filled only with children who are wanted could backfire and create a planet crammed almost exclusively with emotionally, financially, and intellectually deprived Third World bastards. This wasn’t the case before feminism came along to empower women and free them from childbearing’s oppressive shackles. It wasn’t the case until Big Brother morphed into Big Daddy and financially penalized the intelligent for reproducing as it gave handouts that encouraged cretins to spawn. It wasn’t the case during the Victorian Era, when it wasn’t considered so déclassé for wealthy and intelligent women to have children and when it’s estimated that the mean Western IQ was nearly 14 points higher than it is now. The grand irony is that by failing to breed, this new breed of woman will breed itself out of existence. The utter vulnerability of a baby completely terrifies me. It* needs you, completely. They seem so fragile. Not just their physical soft spots and all that jazz, but they are at such a critical phase in their mental development. They are sponges. They have big eyes, and they watch everything. They are thinking, but they can’t speak. What if I say or do something and cause this pure little creature, immense, irreparable mental damage!? What if I crush it in its sleep like one of those prostitutes in the Old Testament? How could I live with myself? Young children have all these crazy dietary restrictions…like they can’t eat honey. What if I forget? I don’t know what would prompt me to want to feed them honey, but it could happen. Baby diets are stranger than Sylvester Graham’s eat-your-way-to-heaven plan. At what age can kids even eat solid food? What if they have an allergy you couldn’t know about until the baby has a reaction? I don’t want to jinx myself. I want to hold your baby. I know I have that look in my eye, I’m confused, scared, curious. I look at it curiously and it looks back at me, also with eyes filled with wonder and bewilderment. I want to hold it. It’s cute (maybe, maybe not), but as a child I remember one of my cousins saying that she didn’t want to hold the baby because she was “afraid she might have one.” Now I know pregnancy isn’t contagious, and I know where babies come from, but something about that image really stuck with me. 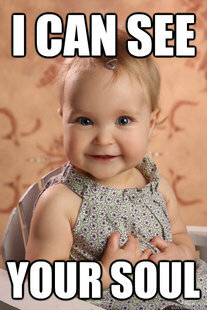 Every time I hold a baby I have to hold back the urge to throw it to someone else and knock on some wood. I’m convinced that my fear of babies has actually manifested itself physically. Brace yourself for an over-share! I’m certain, beyond any rational argument, that I have a retroverted uterus because my lady parts are so terrified of babies, they tilted themselves away from the outside world. Again, it’s not that I don’t want kids. They look like fun. They say the darndest things. Their little shoes are so cool. Not to mention, they provide a great excuse to buy dinosaur-shaped chicken nuggets. Until that time comes, excuse me as I entertain myself with adult things like watching Real Housewives of Everywhere and going to Jimmy Buffett concerts. *I know I called your child an “it.” I’m sorry. It’s not that I don’t think it is a person, it’s just some kind of habit. I don’t know where the habit came from, but it’s there. Maybe I’m just “beyond gender”? Maybe I’m just more accepting of the fact that gender may not be based on your physical attributes, and that in some ways gender is really just a social construct. I’m respecting the fact that one day, your child may come to you and tell you that they are really a man trapped in a woman’s body. Or vice versa. Or maybe I’m just concerned that what I think is your son is really just your ugly daughter. They’re all bald and kinda smushy-faced anyways. 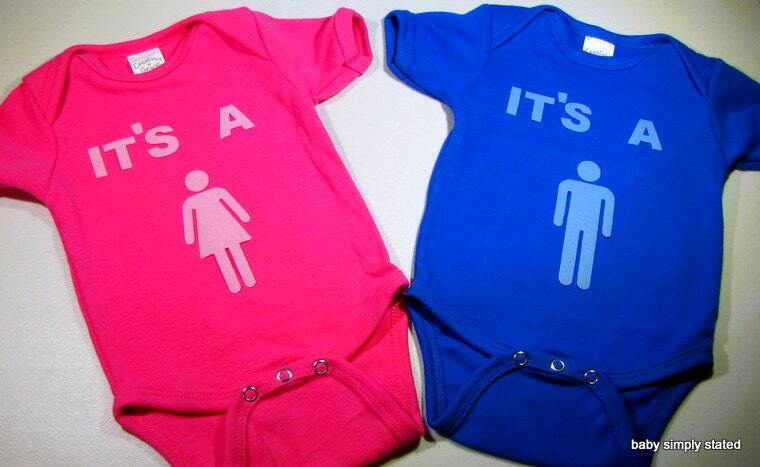 Unless your baby is wearing a onesie that says “Male Genitalia Below,” I’m not sure it’s always safe to assume. Every once in a while I get an insatiable craving for Mexican food. Unfortunately, Washington D.C. and the surrounding areas aren’t known for their ability to really satisfy a California girl’s needs when it comes to South-of-the-border classics. When times get tough, sometimes a girl has to take her destiny into her own hands. But being the adventurous eater I am, I couldn’t help but put a twist on one of my childhood favorites, chicken mole. Chicken mole is a classic Mexican dish–some even call it the national dish of Mexico–known for its symbolic representation of the mixing of European and Indigenous cultures. In fact, mole may be one of the first international dishes of the Americas, mixing ingredients from the local land, Europe, and Africa. The base of the dish, however, is deeply rooted in the history of Mexico. According to legend, during the early colonial period, the archbishop was scheduled to visit the Convent of Santa Rosa in Puebla. Upon hearing of his arrival, the nuns of the convent went into a panic knowing that in their destitute state they had nothing to serve him. And so, as nuns often do, they prayed. They brought together what they did have: chili peppers, spices, old bread, nuts, and a bit of chocolate. They mixed it together and poured the sauce over an old turkey they killed for the occasion. It was well-worth the sacrifice, because the archbishop was smitten with the dish. Why wouldn’t he be? The deep, complex, spicy, sweet, nutty, smooth flavor of mole could win just about anyone’s heart. So what’s the twist? 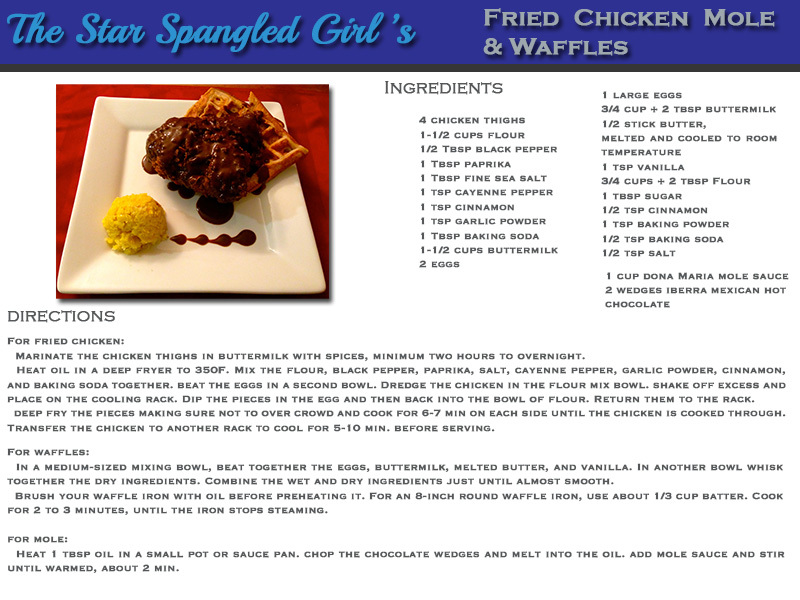 In order to make my chicken mole suitable for the star-spangled table, I decided to combine it with a classic American dish–chicken and waffles! 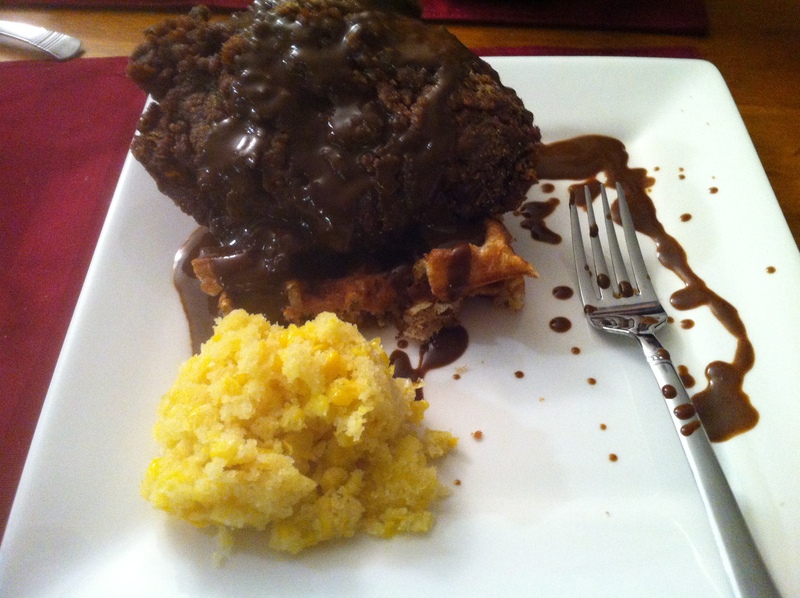 That’s right, I made Fried Chicken Mole & Waffles. The crispy fried chicken, buttermilk-cinnamon waffles, and the rich mole paired perfectly with Mexican corn cake, plantain chips, and guacamole made in the mortar and pestle Anthony bought for our 1-year anniversary. To top it all off, Anthony and I decided to have a plate-off to see who could make the food look completely and utterly irresistible. I think the results really speak to our personalities. Whose is whose? Let’s see if you can figure it out. Did you know: Mole is so synonymous with celebration that in Mexico, to say “to go to a mole” (ir a un mole) means to go to a wedding. Last week, my jaw hit the floor when I received an e-mail asking me for career advice. People ask me for advice all the time, normally about food or fashion. I love what I do for a living, but I didn’t realize it was enviable enough to put me in a position where someone might ask how I got there. To be honest, sometimes I’m not quite sure how I got here. It feels like I woke up one morning and suddenly I was 3000 miles from home, with a Virginia voter registration card, a 401K, $50,000 in student loan debt, and a closet full of awesome clothing. Going to graduate school while working full-time can do that to you–it’s like a 2 year roofie. Stop waiting for “the one.” There’s a very good chance you don’t know yourself very well, so don’t limit yourself to what you think you know. Find something that suits your skills, your talents, and your passion, not just your interests. Just look at House, he may not give a damn about the health of his patients, but he loves solving the puzzles of the human body. Given that you’re not yet set down a defined career path, you still have plenty of time to try out new and different things. Worst case, at least you still have a paycheck while looking for something else to come along. Sucking up is a great way to encourage all of your coworkers to hate you, while also demonstrating to your superiors that you don’t have a mind of your own. In my experience (or at least in my theory), the best way to get yourself a real gold star in the workplace is respectfully disagreeing, and expressing self-confidence and conviction. Especially with the toughest bosses, being able to hold your own, demonstrating critical thinking skills, foreseeing (their) possible missteps, and having the guts to put someone in their place can go a long way. They say you should “Dress for the job you want, not the job you have.” I think a similar principle applies for your work performance. Conduct yourself as though you have the job you want, and bring ideas to the table that will get you there. Don’t be limited by your job description. I always think its funny when people say I’m a hard worker. I’m not. I’m a smart worker, and I’m a smart worker because I’m extraordinarily lazy. I like to be efficient not for the sake of efficiency, but because the alternative is a waste of time, money, and energy. Sometimes investing a little extra work and energy up front means you can be so much lazier later. The shortest route between two points is a straight line–exploit the straight line. Be lazy, be efficient. Show up, on time, even early, and make your presence known. I don’t mean have a parade when you show up for an interview, or constantly talk about how early you got into the office, but do something to stand out. Be proactive in meetings. Be more than a seat warmer. Share a good idea, baked goods, a joke or funny story. Leave your mark on every room you enter, because if they don’t remember you, they won’t miss you when you’re gone. Conversely, when possible, leave. Don’t burn yourself out. When you leave the office and have down time, take care of yourself. You’re no good to anyone if you have no mental energy left. This is also called “work hard, play hard,” but as I said, don’t work hard–work smart! 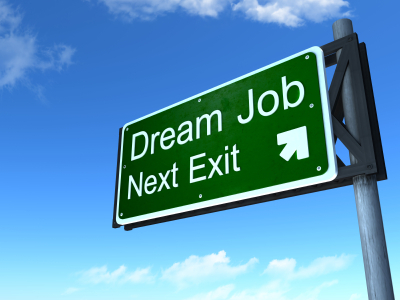 What’s the best piece of career advice you’ve ever received?